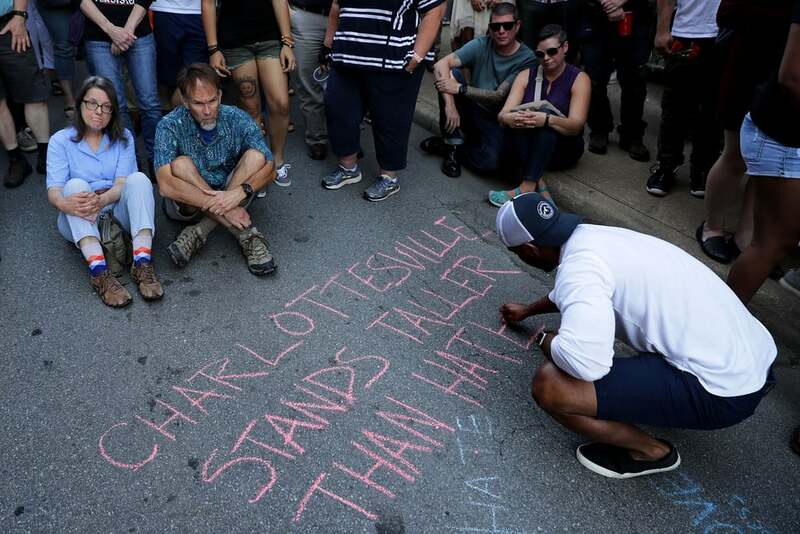 Democratic Mayors were swift to condemn the violence, bigotry and hatred that took place in Charlottesville this past weekend and expressed their support for Mayor Mike Signer and all those affected. Read their statements below. Asterisk indicates a sitting NCDM board member. "Whether it is racist posters at the @UUtah or vile actions in #Charlottesville, we must all come together & turn our backs on hate." “The violence we saw today is heartbreaking, unacceptable and un-American. We must all condemn the hate, violence and terror perpetuated by a treasonous gang of white supremacists. Today there are but two sides: one which favors those who created the mayhem and the other which stands for righteousness and justice. Washingtonians and I stand firmly and unapologetically with the latter and offer our condolences to the families of those who perished and our support to the injured." "#Columbus stands with Mayor @MikeSigner and the people of #Charlottesville. We must all speak out against acts of hate and violence." 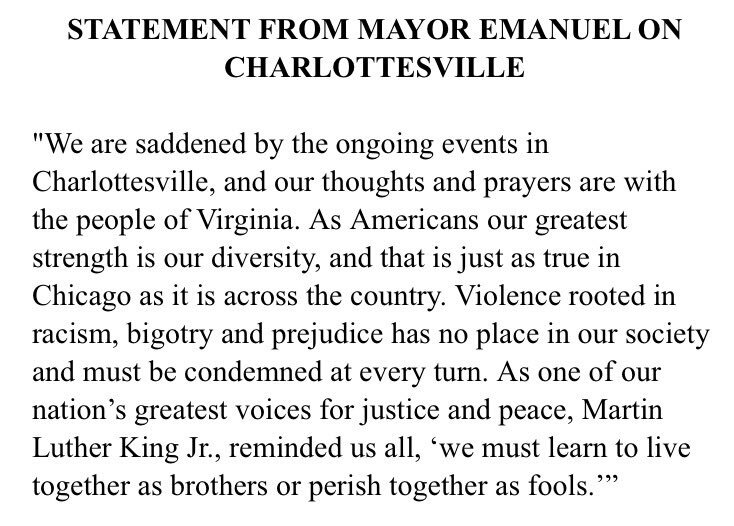 “DENVER - Mayor Michael B. Hancock today released a statement in support of the nationwide demonstrations against the violence in Charlottesville, Virginia -- denouncing hate and promoting solidarity. “I applaud the true Americans all across our country who have stood up, marched and denounced the hateful messages and violence of wrong-minded people. Once again, Denver and Colorado choose to stand on the right side of history and state irrevocably that we will never accept this resurgence of intolerance, hate and now violence in our community, or any community, in this great nation. While some seek to poison our national discourse and pit neighbor against neighbor, Denver will remain on the side of righteousness and the belief that there is unbound strength in the diversity and pluralism underpinning our American exceptionalism. And we will continue to stand steadfast and united against those that seek to divide us. 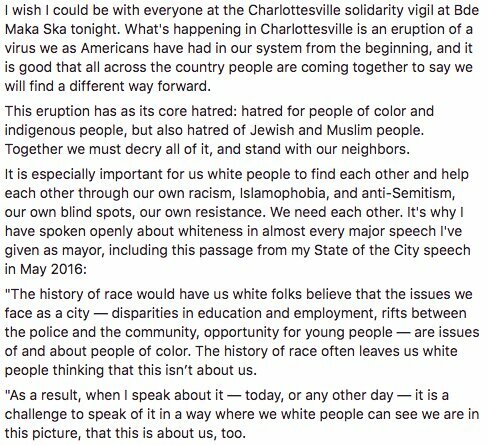 “I wish I could be with everyone at the Charlottesville solidarity vigil at Bde Maka Ska tonight. What’s happening in Charlottesville is an eruption of a virus we as Americans have had in our system from the beginning and it is good that all across the country people are coming together to say we will find a different way forward. “I remember the first day we learned about the KKK in elementary school. I don't remember what my teacher said but I remember my classmates - mostly white - coming up to me after to say that they would never let that happen today. They were in tears. They did not think that my being black made me any less smart, good, or worthwhile than them. They made me feel safe in my school. Safe enough to learn and focus and make friends and be happy. And they made me feel lucky to be alive now and not "then". The Klan is marching in the streets of Charlottesville, Virginia. Without hoods. They feel that their opinion is now politically safe. I just turned on CNN and watched our President say that there are problems "on many sides." He couldn't say that people of color deserve safety. He didn't say that white supremacy is wrong. He didn't say that removing Confederate statues isn't an attack on all white people - it's simply a rebuke of the Confederacy. The President of the United States doesn't have the moral clarity of my 9 year old friends. I can't imagine how scared I would be if I was in elementary school now. I know I wouldn't be able to focus, learn, or make friends freely. "I have seen tonight the images of torches on the Grounds of the University of Virginia. When I think of torches, I want to think of the Statue of Liberty. When I think of candelight, I want to think of prayer vigils. Today, in 2017, we are instead seeing a cowardly parade of hatred, bigotry, racism, and intolerance march down the lawns of the architect of our Bill of Rights. Everyone has a right under the First Amendment to express their opinion peaceably, so here's mine: not only as the Mayor of Charlottesville, but as a UVA faculty member and alumnus, I am beyond disgusted by this unsanctioned and despicable display of visual intimidation on a college campus." “My heart goes out to the victims of a clear and brazen act of domestic terrorism. I am deeply disturbed by the despicable violence carried out today by white supremacists and neo-nazi thugs in Charlottesville that has shaken an entire country.